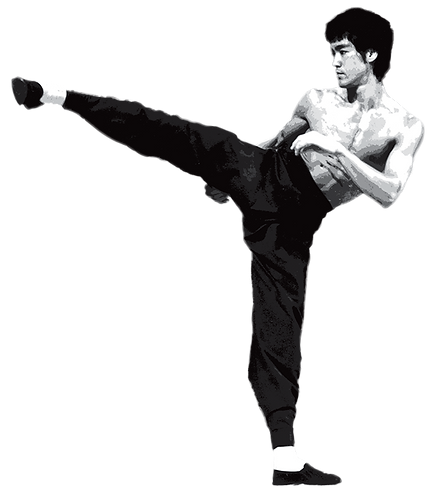 Jeet Kune Do is a martial art, created by Bruce Lee in the 1970’s. He invented this “way-of-no-way” or “style-of-no-style” as a way to break free from traditional martial arts that he once called a “fancy mess”. However, along with some very interesting and ground-breaking ways to defend yourself, there is a greater philosophical side to Jeet Kune Do. In JKD, Bruce Lee placed great emphasis on the directness of self-defense. He did not support the fancy movements that did nothing more than put on a good show. The stuff you see in the movies can be quite misleading. When your life is your concern, you have no time to think about a certain defensive maneuver. You have to act. Which is why, if you study martial arts for the sake of self-defense, you should learn to flow with the situation. Accept what your opponent gives you, and allow ‘it’ to react. Do not conform to ‘fixedness’. Martial Arts can indeed seem complicated at times. This is something you should work to prevent. When defending one’s self, do not allow your mind to freeze. Do not focus on yourself, or worry about self-preservation. Do not fight against these, however. Simply let go. There is no ‘I’. There is no ‘opponent’. That is when Martial Arts reaches its highest meaning. Art is that which you feel, that which you know, and that which you understand from within. Art is then the outward creation of what you have within you. It is the spiritual and conceptual place in the physical world. Do not confine yourself to that which is not an expression from within. Allow your mind to empty of such concepts of good or bad. Easy or difficult. Correct or incorrect. Doing so will allow you to see everything as it is, without the mind’s influence. This is your soul telling you the truth.